I'll be the first to admit that I wasn't the biggest fan of Hush, Hush. I really liked the idea of it, but I found Patch to be creepy and Vee to be irritating and I wanted Nora to grow a backbone. 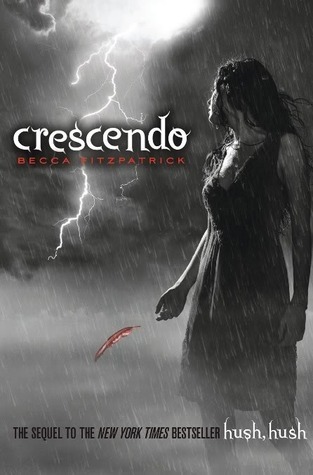 I was on the fence for quite a while about whether or not I wanted to pick up the sequel, Crescendo by Becca Fitzpatrick, but when a friend sent over her spare copy of the book, I figured I might as well give it a try. And my experience of reading Crescendo was a very different experience to that of reading Hush, Hush. Perhaps it was my lower expectations going into reading the book, perhaps it was my own emotional vulnerability as I read Crescendo at a very trying time in my life - whatever it is, it turns out that I really enjoyed Crescendo. I found Crescendo to be really heart-breaking to read and I found my heart hurting and the tears flowing down my face as I read it. I still have my issues with it, of course. I find it really disturbing that Nora and Patch have a relationship in which Patch doesn't trust Nora enough to tell her important information and that Nora's lack of trust and faith in Patch means that she's able to be manipulated into believing terrible things about him. But then, without these sort of conflicts I guess it would be hard for the plot to move forward like it does. These weren't large enough issues for to stop enjoying the story however. Crescendo begins shortly after Patch sacrificed himself and became Nora's guardian angel. Things should be wonderful for the loved-up couple, but Patch is under close watch as trouble brews between fallen angels and the nephilim and worryingly for Nora, Patch seems to be spending an awful lot of time with Nora's arch-enemy, Marcie Millar. As Nora frets and worries and makes important and drastic decisions with her relationship with Patch, who doesn't let Nora in what's going on or what he has planned, other strange things begin to occur. When an old family friend, Scott Parnell, arrives, it seems to be the beginning of Nora unravelling both the mystery of what Patch is up to (and what's going on between Patch and horrid Marcie) but also about Nora's father's death 14 months ago. Things begin to get really dangerous and poor Nora is left without the protection of Patch. Like I said, I found Crescendo to be heartbreaking. I could fully understand the confusion and hurt that Nora feels as Patch distances himself from Nora in order to spend more time with Nora's enemy. She's hurt and jealous and angry but what's worse is that she still wants to be with Patch and to be near him. I felt like I had a bit more respect for Nora as she makes these difficult choices, I didn't have any strong dislike for either Patch or Vee this time around, and for the most part, I found Crescendo to be hugely addictive reading, very exciting and incredibly emotional. I'm so glad that I gave this book a chance to change my mind about the series! Sophie - Oh dear. Yes, that does speak volumes. I read Crescendo when I was feeling incredibly emotionally vulnerable and reading it felt like having my heart ripped out. So it really worked for me.